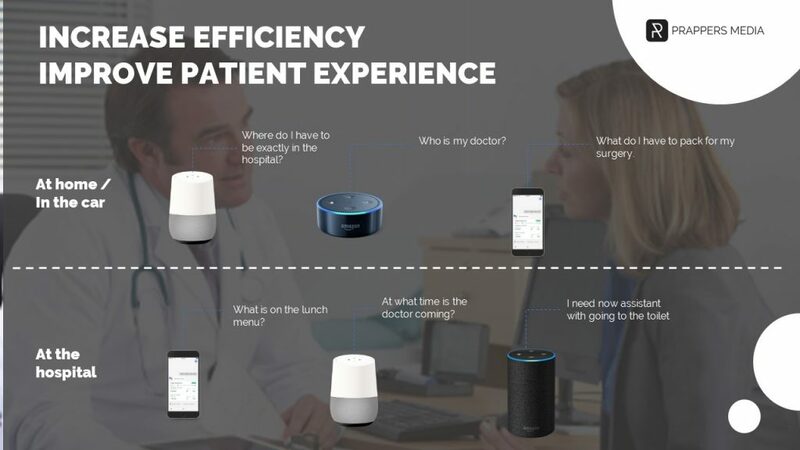 Voice assistants can help increase efficiency and improve the patient experience at hospitals and with healthcare providers. The main reason voice assistant are becoming more popular for healthcare is ease of use. People can speak to them as they would speak to a normal person. This even applies to the senior population. Seniors are a large part of the patients that need healthcare and are in more need of information about their health and their health needs. Also for patients at home voice assistants, like the Google Assistant on your mobile phone, can be very usefull to get information and advice. A patient might want to know upfront where he/she could park the car, who the doctor is or the exact routing within the hospital. Or even earlier in the process, the voice assistant allows patients to get information about the nearest urgent care and hospital locations, as well as the approximate wait times at those locations. Or the patient can use the voice assistant technology to schedule their personal care attendant, the technology can then check on schedules to see who is going to be on the next shift. Patients can set reminders for routine tasks such as taking medications, setting up doctor appointments, and other medical events or simple health advice, like information on common conditions and medicine dosing.